Valentina is now 21 months old. She’s grown so much in the last year.. let alone in the last few months. I wanted to start the New Year right. We took away the pacifier and have no problems with that. I also wanted to start potty training her but we’re having some issues. Carlo doesn’t seem to think she’s ready. She doesn’t tell us when she’s going. She tells us when she’s gone. I keep telling him that is why it’s called “training.” You have to train and teach her to know the signs so she can tell you before. On the days that we put her on the toilet, she does go without problems. 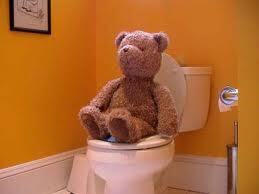 It may take a few times, but that’s what potty training is all about. After a few days, I got sick and couldn’t help Valentina so, we went back to regular diapers. Now, we’re back at square one. We ask her if she’s gone and she says no. When she does, she just smiles when we ask her. I would love for her to be on the road to success by the time the baby comes but I know that’s not going to happen. Maybe by the time she’s 2, she’ll be half way potty trained.. and if so, then it’s a win-win for all! ps.. If you have any tips.. I’m all ears! T minus 5 weeks and counting..
stella REFUSES to use the potty. when i catch her squatting down to poo i try to take her and she kicks and screams and bites me. no idea why she hates the potty. shes almost 2 1/2! lol so no advice here!